Star Wars: Battlefront will have AI-controlled enemies for single-player/co-op modes like Survival, but there won't be a proper single-player campaign for players to dig into. The reason for that, Electronic Arts Chief Operating Officer Peter Moore told Gamespot, is simple: Hardly anyone would bother playing it anyway. Moore said decisions like this are made years in advance of a game's release, and that can sometimes lead to problems. "Between when a dev team starts work on a game, and when it finishes, the world becomes a different place. I remember when we started work on Star Wars: The Old Republic; at the time, the model to go for was subscription," he explained. "By the time we had the game ready, the model to go for wasn't subscriptions. That's why we had to stop the game, and rebuilt it as a free-to-play title with microtransactions, but even then there were some people who said they wanted to keep their subscriptions." 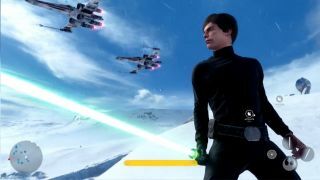 Responding to the suggestion that 'triple-A' games like Star Wars: Battlefront "traditionally" sell better with a single-player campaign than without, Moore said "you might be right," but that "very few people actually play the single-player on these kinds of games. That's what the data points to." EA has said in the past that Star Wars: Battlefront was intended to be a multiplayer game right from the start, but I think this is the first time that anyone has been so open as to exactly why that is. Do you agree? Numbers don't lie, as they say, but would the presence of a single-player campaign make you more likely to buy the game? Or is the online action really where it's at?